Every February and August university students nervously await the bi-annual class registration period. This crucial phase sets the tone for the entire semester, but class registration is so stressful for students. 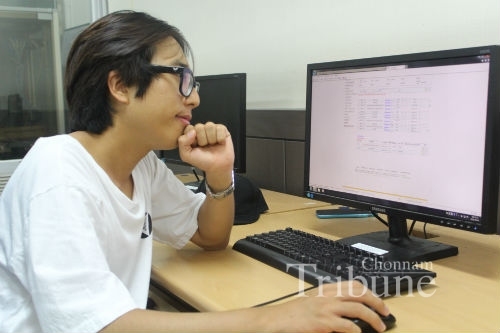 Chonnam National University (CNU) has made an effort to solve the problems related to course registration on a first-come, first-served basis by implementing a course reservation system and drawing up guidelines for course registration. However, many students are still dissatisfied with the system. Fully aware of the situation, the Chonnam Tribune has investigated the issue in order to solicit appropriate solutions. If you have ever experienced difficulties while enrolling in classes on the CNU portal system many of the following issues may be familiar. In fact, most departments have restricted class seats in each course every semester. The reason is that the university doesn’t have enough classrooms or professors to meet its students’ class needs. On the other hand, that’s not all to the story, there is a third party to this dynamic as well-the lecturers. If the professor does not want to have more than 35 students in his/her class, the class size will be set accordingly. Pre-registration results for students’ demands cannot be reflected in course offering of the relevant semester because it was predetermined before the pre-registration period. Hence, the competition between students to secure a spot in their preferred courses is fierce. Meanwhile, students have complained about the lack of English-medium class or variety in major courses. Eager to make progress toward excellence in English, Lim Hyeong-cheon (Senior, Faculty of Economics) expresses his concerns about the insufficient number of English instructed classes at CNU, “There are just a few English courses on campus. How can people who are interested in English, like me, get better at the language if there are not many opportunities to do so?" With limited English instructed classes and increasing demand for them, some students, including international students, are also encountering this problem. In addition, Lee Yu-lim (Senior, Dept. of English Language and Literature) shares her need for more diversity, “One thing about the system is a lack of variety. For example, my major does not have enough courses in English Linguistics compared to that in Literature." This causes an insufficiency in providing linguistic knowledge for students interested in the subject. Furthermore, there are compulsory courses that each major requires to be taken, which can be quite competitive to register for as the demand is high, while a lack of seats exists for most each semester. Regarding the aforementioned problems, an official from the Register’s Office (RO) said, “There are 600 English courses out of the total 6,000 courses held on the entire campus; including graduate schools." Compared to other universities, CNU holds a lot more classes in English. However, in such a case where students wish to have more, it has to be discussed by each department and their Professors because each department is responsible for proposing lecture plans to the RO." Regarding major compulsory courses, it’s all up to each department as well," the official commented. Also, if too many students want to participate in a particular course, that department has the authority to change the prearranged lecture room to a larger one. A large number of students acutely experienced difficulties in selecting courses due to insufficient class information; some courses without lecturers’ information or class syllabi. Korean education prioritizes the importance of professors. Thus, having their personal and academic information is crucial while selecting classes. Nevertheless, sometimes this is not available to CNU students during the registration period. Responding to this situation, the RO department disclosed the ‘Time Lecturer Law’ in case of last spring semester. Due to the sudden change of enforcement dates of this law that was planned to be enacted on January 1, 2016 but was subsequently postponed until sometime in 2018, lecture investigation could not be held at the correct time and the office could not upload professors’ information until the decision was finalized. “That is the reason why the reservation period was extended last spring semester. To make sure the same situation is not repeated in the upcoming semesters, we did our best to upload each professor’s information and syllabi. We will ensure that related information will be transparent and accessible to students from now on," the RO’s official emphasized. There is still a need for an English language portal system, although the population of Korean students surpasses that of international students. Considering there is an increasing flow of international students arriving to CNU each year and CNU’s goal is to become a more competitive global campus, having such a system is not a luxury; but rather, a necessity. Acknowledging the limitation, the Office of International Affairs was willing to create an English page for foreign students, but just when this plan might be implemented is still unknown. However, some of the international students have a different idea about the English version of the portal system. Nguyen Thi Hai Giang (Senior, Dept. of English Language and Literature), who speaks Korean fluently, has not experienced any difficulty registering for classes, and suggested that other international students should adapt to the language in order to facilitate their learning to their highest potential while CNU works toward an English language portal system. Nobody wants to start on the wrong foot at the beginning of a new semester while still full of hope and eager for excellent grades. Hence, ensuring the class registration system is easily accessible and fulfilling student needs would be a boon to registering students, which could alleviate undue stress and help facilitate their academic excellence. According to this year’s undergraduate survey results released by the Office of Student Affairs, besides a number of students who are pleased with the system, the most unsatisfied segments of CNU’s education were the class modules and class registration system. The Administration Headquarters needs to primarily aim at developing specific practical solutions such as employing new professors, increasing the number of part-time lecturers responsible for popular classes and making better use of spare classrooms on campus. Another necessity is an establishment of an English portal system which will not only allow international students to manage their class registrations independently and effectively but also pose as a leverage to push CNU’s international competitiveness forward.